Fidget, aka Bohemian Fidget, is a gorgeous 4-year-old black female born April 23, 2000. Fidget's sire is Minaki Zeke, and her dam is Iruska Daisy. Fidget started racing in Florida on November 21, 2001; then she went to Shoreline in CT, and finished up her racing career at Valley Race Park in Harlingen on December 27, 2003. She is very friendly and calm, and might be a little shy at first in new situations, but warms up quickly. 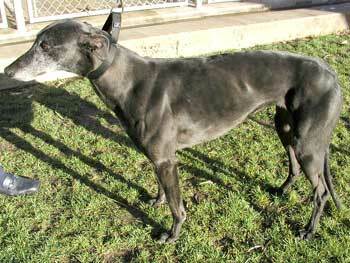 She was a favorite at the Harlingen track, and GALT's kennel manager there says Fidget was her "favorite". 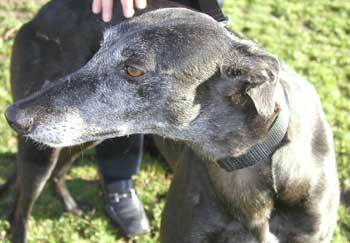 She gets along well with other greyhounds and large and small dogs, but it is not known yet if she is cat tolerant. Hello! My name is Fidget. I am a bit smaller than most greys, but I make up for my shortage in size by being extra cute. I like all kinds of dogs, small or large, doesn't matter to me, as long as they are willing to play, because I LOVE to play. When I am done running and romping, my favorite thing is to cuddle. Oh how I love to be close to people. I just stand there, and lean on them. Makes me feel so good! Like to get my head scratched too. I think I have come to the best place ever, because there are all these people around me and they constantly hug and love on me. I am not used to that, and each time it happens, it makes me so happy. Somebody told me that once you decide that you want to be my "forever family", things get even better. I can hardly believe it, but I sure do look forward to it. Also, I really like soft beds, and find it extra fun to "nest" by using my front paws, digging, walking around and around in circles, until I have made everything perfect, then I lie down. Then, I have to sigh from the pure comfort of it all. Something else I find very exciting are these things called toys. I enjoy putting them in my mouth and run around with them. Every once in a while, I make them squeak, and it makes me squeak too! It both scares me and surprises me at the same time. If you'd ask me what kind of grey I am, I'd have to say that I am very easy going, happy, big lover of life in general, my cute name fits my personality, because I am constantly told how cute I am. This, my new life, it is really exciting. All I think about now is when I get to meet you, my "forever family". If you come see me, I'll show you what a sweet and affectionate girl I am! Just don't forget to hug me, because I do so like that. That's me - Fidget.